Kalahari Hunting News, Issue #4 -- A Packed Mid-Season! Now that the hunting season is nearing its end here in Namibia, we are getting back to doing more work around the house and on the ranch. 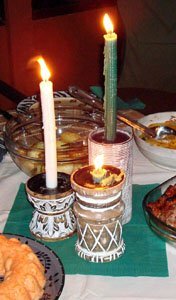 Long ago someone told me that, while living on a ranch, I will always have time on my hands for hobbies, needlework, reading, painting materials, etc. But let me tell you - I haven't find that yet. We are however, grateful that we do not have to cope with traffic and strict, stressful routines everyday like all of you who lives in cities. The work that needs to be done on ranches is actually joyful, since one is surrounded by nature. I want to tell you in this Newsletter about all of the great hunting guests and experiences we had since the beginning of August until now. While preparing all the pictures, I found it difficult to decide which ones to use of all the beautiful hunting pictures we took during this time! Michael and I relived all the good times we had with these guests. We had what you would call: "Happy Hunting"-times. Our climate is changing quickly to summer. 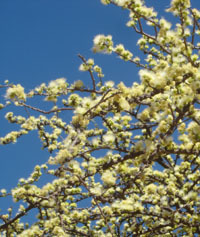 We know that spring will not continue for long and that the new flowers may not even have time to show us all their beauty before the well-known HEAT of the Kalahari will strike! The Kalahari is very dry now and we pray for rain soon. But the region, while looking quite a lot like a real desert nowadays, has its own beauty... from a photographer's point of view that is ;-) and not exactly from a rancher's! The new free Kalahari Wallpaper for you this month, contains a nice Lion-picture. It was taken by Izak Engelbrecht in Botswana. 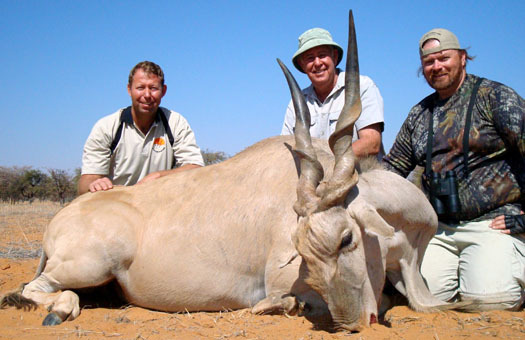 John Muse were the lucky guy who took the biggest Eland trophy ever taken on Uitspan Hunting Ranch! 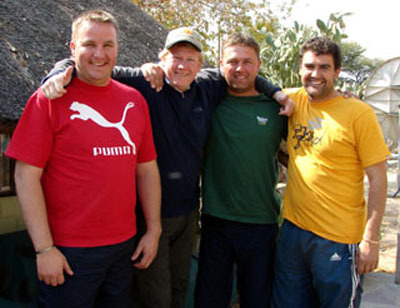 John came hunting with Kobus Honniball and with him were his wife Terry and friends Ernie and Barbara. More of this hunt later in the Newsletter. During the first week of August, Philip Human and his 3 friends (Paul Bester, Stefan Alberts and Frans van der Merwe) hunted for venison on Uitspan. They were from Malmesbury and Cape Town in South Africa. These guys took 4 kudus, 1 gemsbok and 12 springbok. We kept all their meat in the walk-in-coolers and they took it back to South Africa to do the processing at home. Thus they had a nice and relaxing time filled with hunting during daytime followed by story-telling, joking and having fun around the campfire at night. 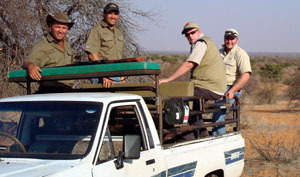 Below: The friends on Michael's vehicle during their time in the Kalahari. 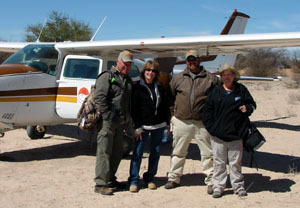 The Human-group was followed up by two retired couples who just wanted a peaceful time in the Kalahari. Pieter Stofberg from Rawsonville in South Africa and his friend came with their wives. They hunted 1 Eland and 1 Kudu. They stayed in our Hunter's Camp for a week. Have you even wonder why people like to hunt? Read this article. 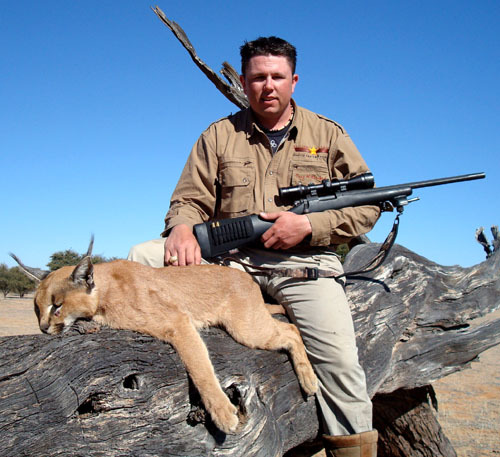 Above: Troy Winterbach with a huge caracal hunted on Uitspan Ranch during July 2007. We told about Troy and his father's hunt in the previous Newsletter. Troy was our first bow hunting guest this year... and was followed by more (see below). Ernie and Barbara Preshard as well as their friends John and Terry Muse visited Uitspan Ranch in the third week of August. On the picture left: our guests had just arrived via charter flight. These two couples had a very successful and special hunt. They took 2 Gemsbok, 1 Kudu, 1 Springbok, 1 Steenbok, 1 Eland and 1 Impala. Barbara and Terry joined the men during every hunt. 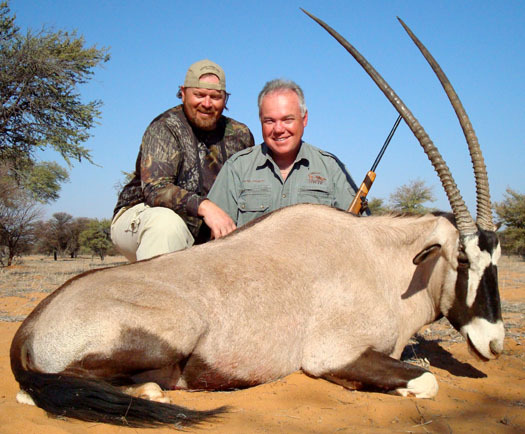 We have included pictures of both their Gemsbok Trophies as well as John's Eland in our Hunting Picture Gallery. Click here to see an updated Picture Gallery! Ernie took a very nice Gemsbok trophy (picture below). 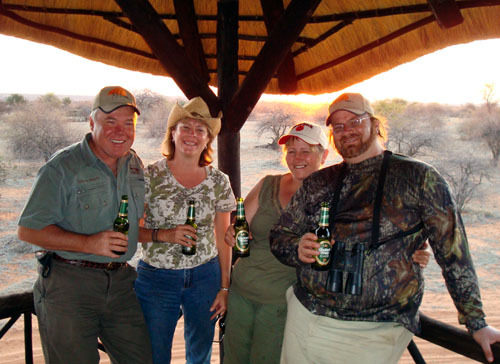 Below from left to right:Ernie, Barbara, Terry and John having a beer in Uitspan Hunter's Camp after a long and warm day of hunting in the Kalahari. In September we have had the biggest hunt of the 2007-season. This was a group of 4 men from San Antonio, Texas (USA). Tom Shields, Mike Deodati, Steve Albright and Jim Shields (who took video-footage of their whole Namibian adventure) came with Kobus Honniball. Steve hunted with his rifle while Mike and Tom are bow-hunters. These 3 hunters took on Uitspan Ranch: 1 Giraffe, 1 Blesbok, 2 Eland, 2 Kudu, 1 Blue Wildebeest, 1 Black Wildebeest, 1 Brown Hyena, 2 Cape Fox, 1 Bat-eared Fox, 1 Gemsbok, 1 Zebra and 1 Steenbok. Tom hunted with a "Mathews Drenalin"-bow and Mike with his "Mathews Outback". They were very happy with the performance of these bows. It was a new and interesting experience to us, since we haven't had many bow-hunters before. We didn't know that a bow can go right through a big eland bull - in the blink of an eye! These 3 guys took exceptional shots. We decided to place more of this big hunt and the beautiful pictures in our next Newsletter, since this one is already filled to the brim - I do not want to slow down your mails too much! 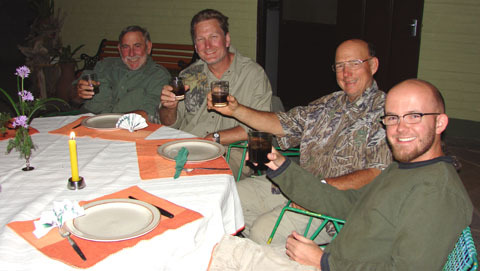 Here is just one picture of the guys relaxing on their last evening with us on Uitspan Ranch. In September we also had John Marshall and John MacDonald from Davenport, Washington. We became friends on a previous hunt two years ago and this time they just wanted to visit us. We feel honored. We had a great few days together. 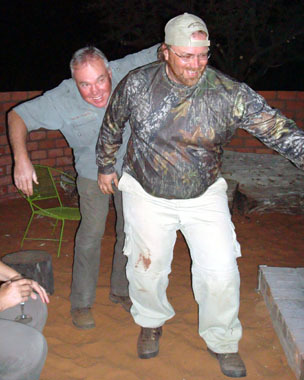 Our son Jan-Hendrik had his birthday and John and Marshall could experience a traditional "Kalahari Lamb Barbecue". More of these pictures also in the next Newsletter. Watch Tiaan's Kudu Hunt Video here. I plan to put on our website detailed pages of all the beautiful animal species to be found in the Kalahari. This month I managed a page on the "Greater Kudu". Have a look at the info and pictures of the Kudu antelope. We thought it a good idea to give our former hunting-guests a tool to share their experiences and pictures of hunts on Uitspan Ranch with our website's visitors. This way it will be shown to the world and all other hunters will enjoy it. We found however, that people tend to not take the time and bit of effort to do this. We hope that all the contributions will be coming soon. It will inspire the rest as soon as one example is live! If you are one who had forget about this, add NOW your experience on Uitspan! We have put together new special hunting packages for hunts booked for Februarie till April 2008. This may be the time to tell your friends about this special opportunity... to grab their African Trophy Hunting Adventure - right here! This story, "In the blink of an eye", was recently published in "African Outfitter" Magazine. It tells about a hunt that took place in Namibia earlier this year and how something terrible happened to an experienced and keen hunter. Since all of us can learn a valuable lesson from this, I included the link in our Newsletter. Click here to read this interesting story! Another great article I want you to enjoy is about a Kalahari Lion Hunt. It took place in the Kalahari region of Botswana. It is these well-known lions which occasionally also enters our ranch and cause losses. Click here to read about the Kalahari Lion Hunt. "...Knowing himself as claimed by a God of sovereign mercy, the redeemed one has peace and joy unspeakable, and he glories in the cross and will glory in God forever more." A traffic cop pulled a farmer over for speeding. The farmer pleaded that he wasn't much over the speed limit. But the cop continued to slowly write out the ticket. He brushed a fly off his face. The cop carried on writing.